Official LEGO® timepiece maker ClicTime recently introduced a new style of their popular LEGO Minifigure clocks. As well as the currently available range based on The LEGO Movie 2, later this year there will be a number of new LEGO Star Wars clocks. I revealed them a couple of weeks ago, but these standard releases will be joined by a couple of very special 20th Anniversary edition. There will be a gunmetal LEGO Vader Minifigure clock and a gunmetal Vader Buildable watch, which includes the 20th years of LEGO Star Wars logo on the watch face and special printed links. These special LEGO Star Wars 20th Anniversary ‘Gunmetal’ edition timepieces will be available soon. 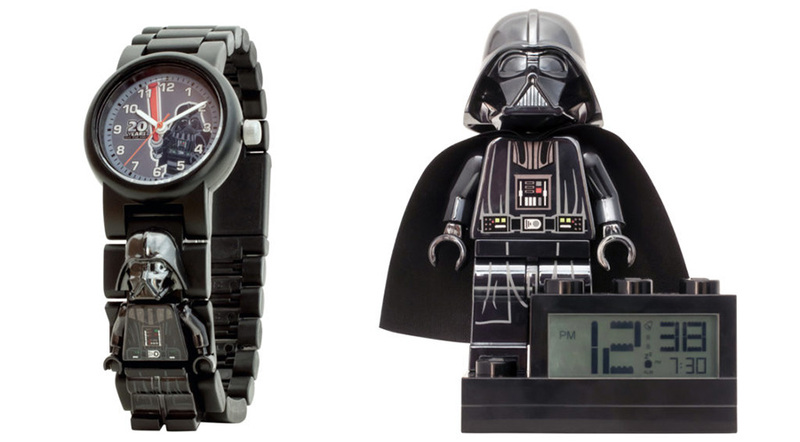 The LEGO Star Wars 20th Anniversary Darth Vader Buildable Link watch comes complete with a special 20th-anniversary watch dial, a gunmetal mini-figure link and 2x 20th anniversary printed links!! For ages 6+ this watch will be analog and water resistant up to 50 meters, it will also come with batteries included and a manufacturer warranty of 2 years! The LEGO Star Wars 20th Anniversary Darth Vader Minifigure Alarm Clock comes with a special edition gunmetal mini-figure design along with fantastic characterized alarm sounds. The clock also give the options for 12 or 24 hr time display, standing at 6 inches tall with light-up display and backlight features. For ages 6+ is comes complete with 2xAAA batteries and a 2-year manufacturers warranty!